Krakow’s emerging food scene is contemporary and uniquely fusion but the city, and Poland, is still a meat and potatoes kind of place. Polish basics like bread and sausages are hearty, savoury and insanely cheap! You can stuff your face for 20 zlotys (5€) at lunch or indulge in a nice restaurant for just slightly more. It’s the ideal food experience and a good excuse for a little gluttony. In Krakow (pronounced crak-ov), the best places where I went to eat Polish food were ones recommended to me by local people. After all, who knows better than those who actually live here? Here are 5 delicious Polish foods to eat in Krakow and where you can find them. In Central and Eastern Europe, each country on this side of Europe has their own version of dumplings. Czechs have their bread dumplings for instance and Hungarians love their noodle dumplings. For Poles, its pierogi. 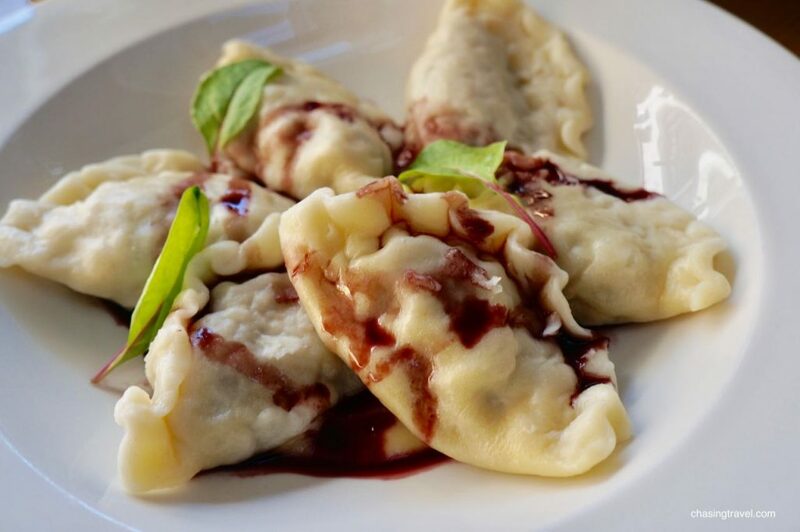 These Polish dumplings come in all different styles which can be baked, fried, boiled or steamed. They’re deliciously light pockets filled with various meat, potato, veggie, or simply cheese. There are so many kinds of pierogis to try that’s why the best place to eat pierogis in Krakow is at a pierogi kitchen. When I stumble on a place that looks like my grandma’s basement, I know the food has to be good! 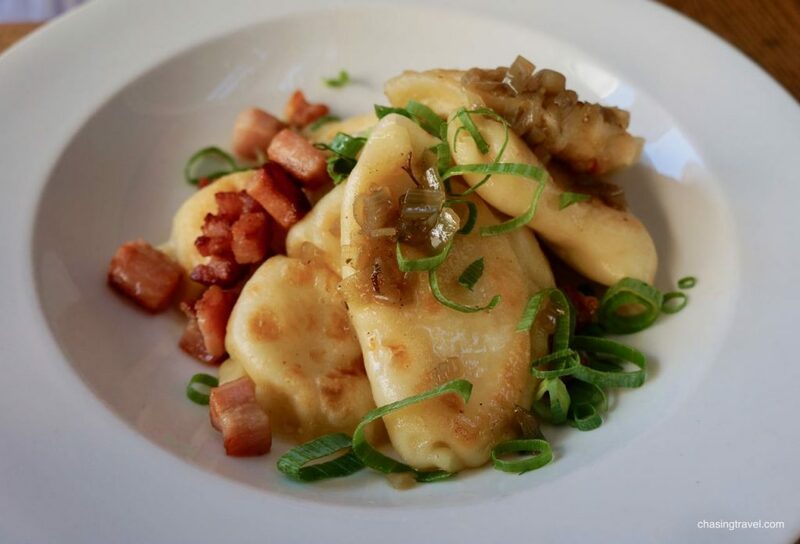 Przypiecek is a 24hr hot spot that rolls out delicious pierogis non-stop all day and night. It’s popular with both locals and tourists. 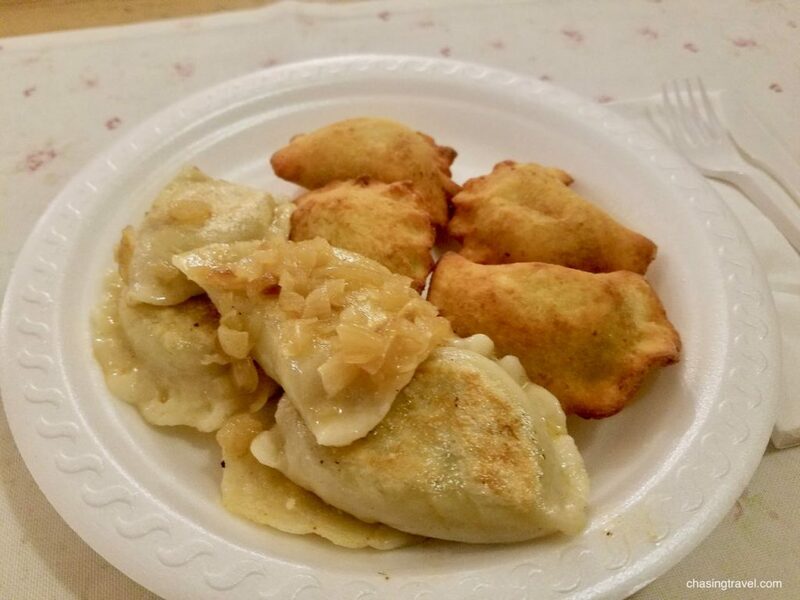 I loved this place because you could choose from dozens of styles of Polish dumplings like fried deer or spinach & cheese from the paper menus that hang on the walls. A soup plus 5 pierogis only cost me 20 zł (about 4.60 €). Stawkowska, 32. My other ultimate pierogi experience was eating in Warsaw. Traditional polish sauerkraut and meat stew is the ultimate Polish comfort food. This national dish is common in Polish kitchens but variations differ from home to home like adding smoked sausage. 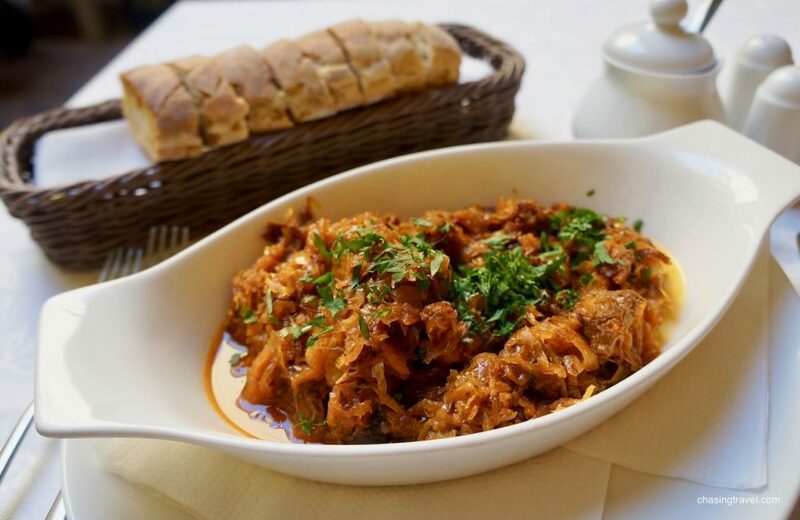 Bigos is usually served with fresh bread, perfect to scoop up lingering pieces. Restauracja Miód Malina is also old-style and folksy in its decor but their recipes are traditional and homestyle. 25 zł. Grodzka 40. Poland happens to be the largest exporter of mushrooms in the world so it’s no surprise then that they know how to use their shrooms. 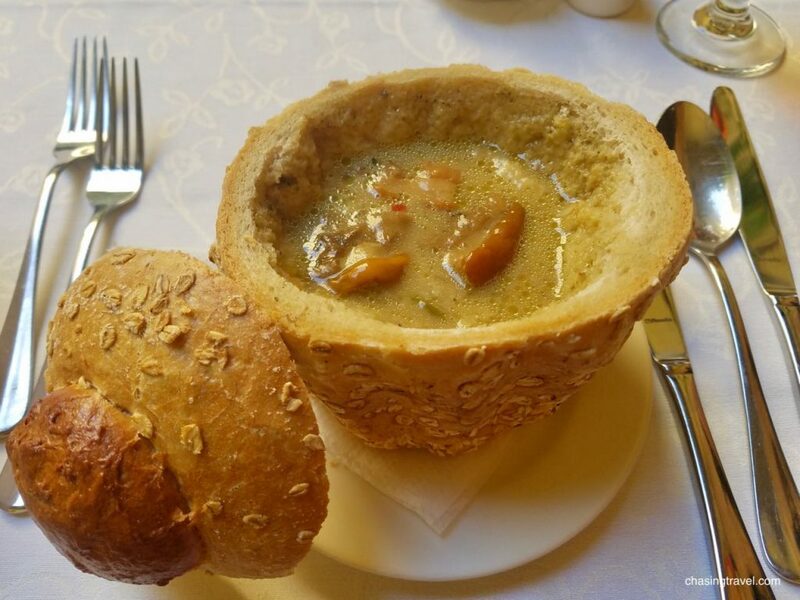 Polish cooks make a mean wild mushroom soup or zupa grzybowa, served in a crispy artisan bread bowl with a deliciously creamy texture. Mushroom soup is traditionally eaten on Christmas Eve here but I would devour this dish anytime of year. Mushroom soup may also be the most sustainable dish you’ll ever eat – you can eat both the soup and the bowl! Restauracja Miód Malina. 24 zł for a bowl. Grodzka 40. The trendy yet important district of Kazimierz is where you’ll find Poland’s version of pizza. 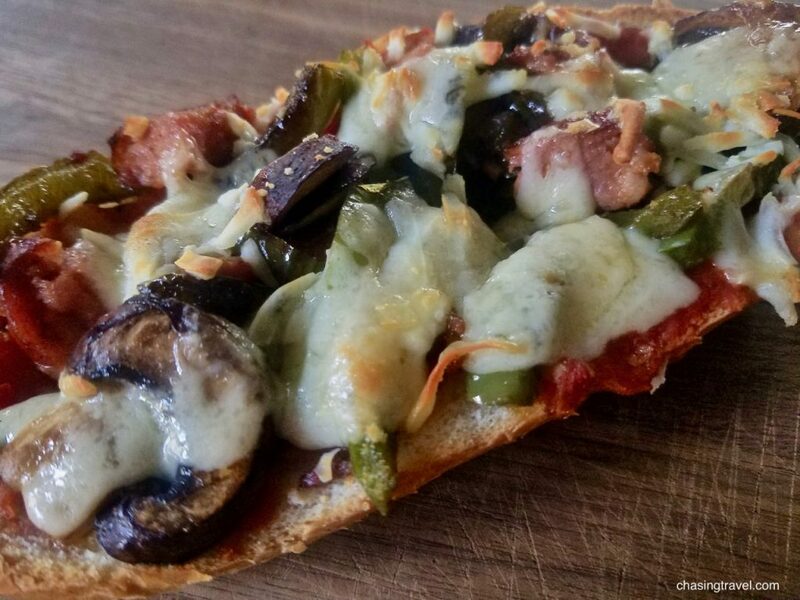 Zapiekanki is a long, crispy baguette with pizza-like toppings. In the centre of Plac Nowy (New Square) are a bunch of food stall windows – just walk up and choose from dozens of varieties. 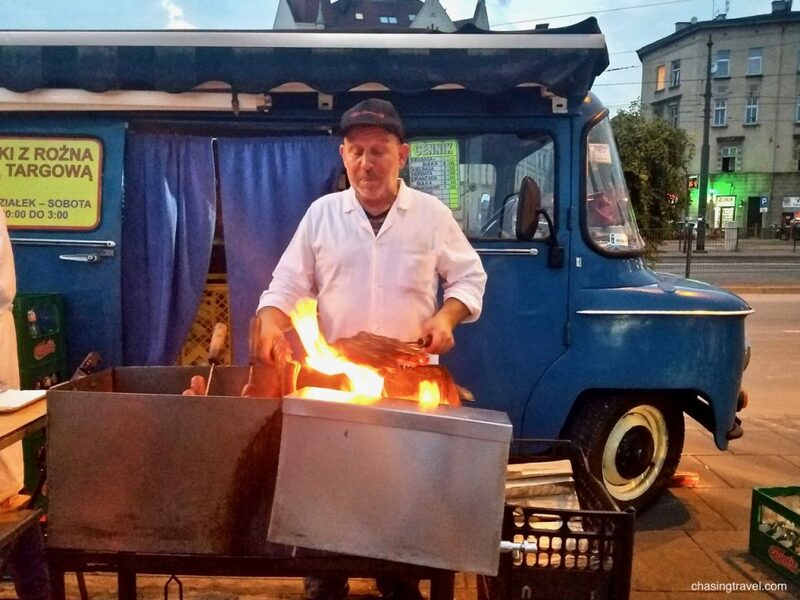 Since Kazimierz boasts Krakow’s popular bars and nightlife, day or night there’s almost always a window open, baking up hot Zapiekanki. The best ones are saucy and cheesy. The area around Kazimierz is especially worth exploring. It used to be the centre of Jewish life until Nazi Germans took over during WWII. Dodgy and in ruins for nearly four decades, it was revived in the ’90s, after the fall of communism and the movie, Schindler’s List. 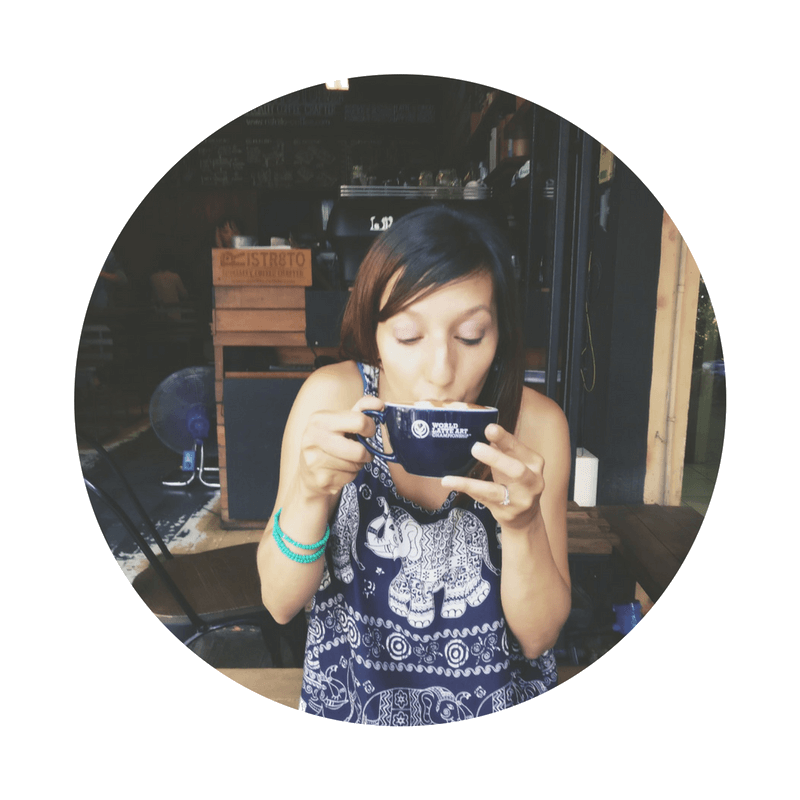 Today it’s known for its nightlife, trendy bars, cafés and zapiekanki. 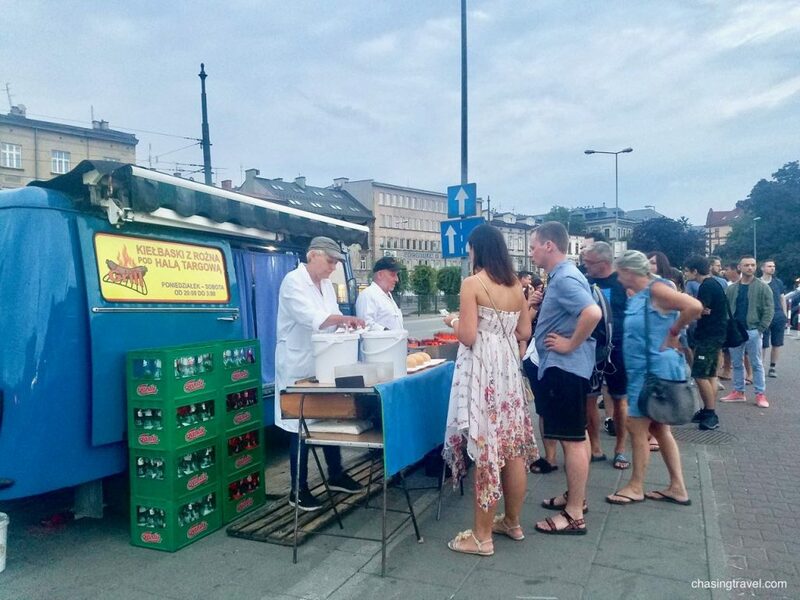 No Polish food experience is complete without eating sausage from Krakow’s first food truck. 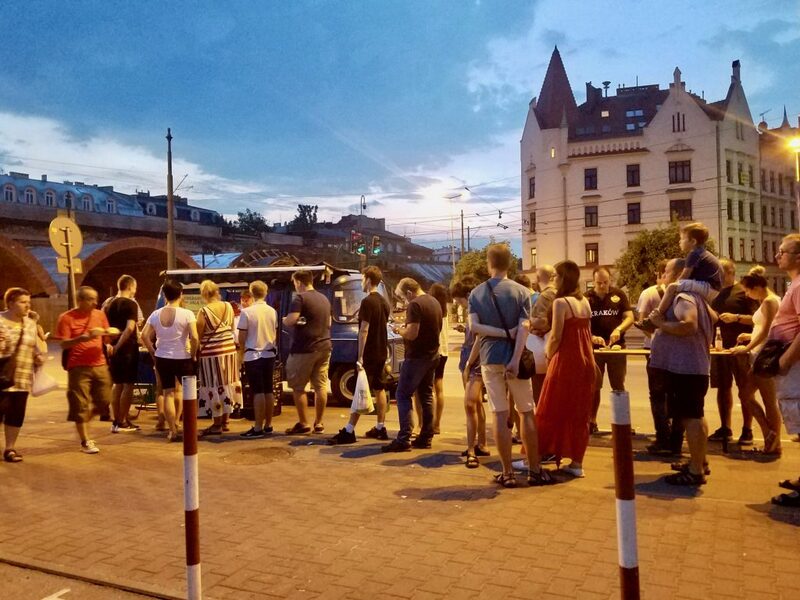 Started by two taxi drivers, their steel blue Soviet van in Targowy square has become a food institution in Krakow for over 20 years (and with a queue to show for it). For 8 zł you get a delicious wood-fired kiełbasa, grilled right in front of you with a bun, ketchup, mustard and drink. It reminded me about my love for eating Czech sausage in Prague. They open after dark from 8pm til 3am (except Sundays and holidays) – perfect for that late night hangover cure. Kiełbaski z Niebieskiej Nyski, Grzegórzecka 3 in Kazimierz district. Green Way Food for Life, Krupnicza 22 – A vegetarian, vegan, sustainable food spot if you’re looking for a break from traditional Polish. I pleasantly stumbled on this eatery when I was looking for a quick bite close to Hotel Amber where I was staying. If you’re looking for a place to stay in Krakow, by the way, I highly recommend the Amber. 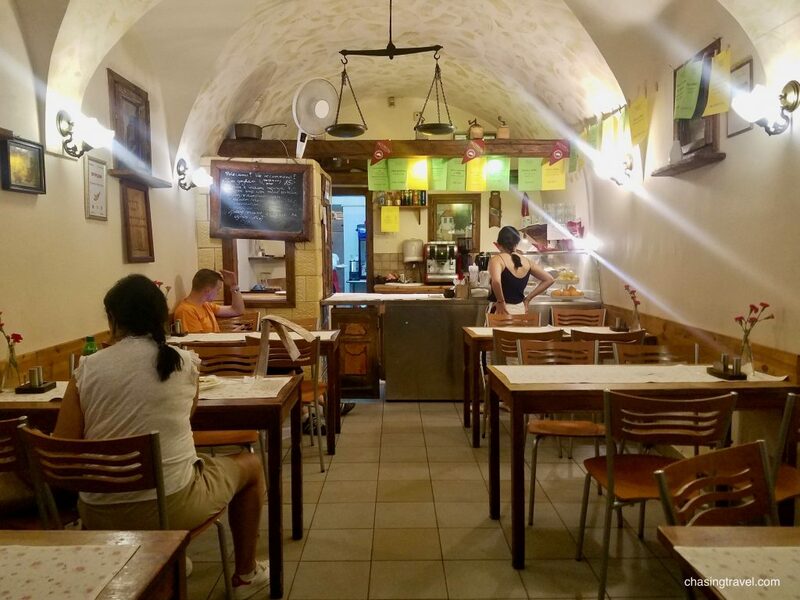 During my tour of Poland, I was a guest of JayWay Travel, which provides customized and personalized trip itineraries in Europe, including your very own personal local rep on the ground to help you get the most out of a city. 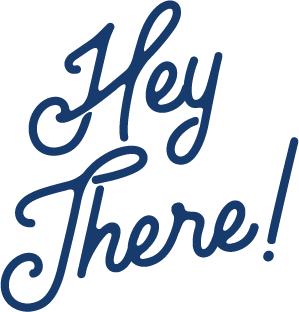 Some of the food spots I mentioned were recommended to me, and some I discovered on my own. As always, all opinions are my own and I would never recommend something that I didn’t experience or enjoy myself.